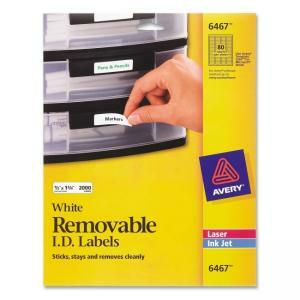 ID labels stick, stay and remove cleanly to make changes and revisions. The rectangular shape makes them ideal for binders, diskettes, file folders, cassettes, drawers, containers, boxes, shelves and more. Labels adhere to smooth surfaces, including paper, cardboard, plastic, wood, glass and metal. Labels are compatible with laser and inkjet printers. Avery offers many easy-to-use templates for Microsoft and many other popular software programs.